Customers might delay the upgrade of their iPhones or choose an older iPhone model which is priced modestly. This becomes more important when we note that there won't be a 5G iPhone in the next cycle. Also, the bill of material to retail price ratio of older models will be much higher than the newer models. This would reduce Apple's margin in its most profitable segment. Investors should buckle for a long bearish sentiment for Apple. Before the start of this cycle, I mentioned that we could see new iPhone models priced modestly. However, the company surprised the markets and most of the analysts by shooting for a big increase in iPhone price. This was seen as a proof that the company believes it has better pricing power. Reports are now suggesting the demand for new iPhones, including iPhone XR, is quite low. Massive production cuts of almost one-third of the 70 million iPhone XR units have been mentioned. These would have been built between September and February. A massive production cut in a model was used as the biggest driver of unit sales for the company. One of the reasons behind this cut is the lower demand of iPhone XR in international markets. 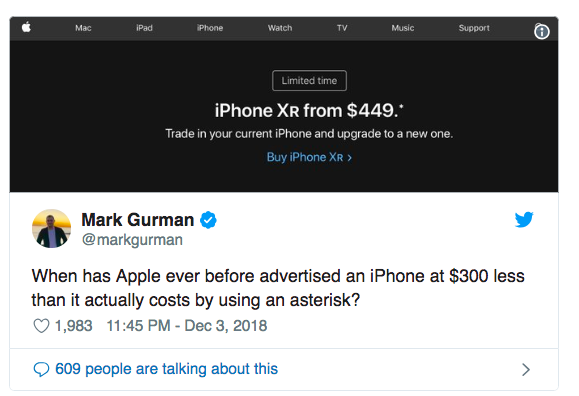 Even though the company forecasts that a cheaper version of iPhone XS would improve the addressable market, the price of this model is still too high. Many emerging market economies are facing challenges in terms of currency devaluation and slower economic growth. This has reduced the demand for iPhones and also increased the prices in the local currency. Another important factor is the rapid growth in Chinese OEMs in China and other regions outside the US. We can see this from the recent growth of OnePlus devices which are generally priced in $ 400-600 range and have very high specifications. OnePlus has also worked on improving the branding of the devices which has helped the device stand out as premium products. 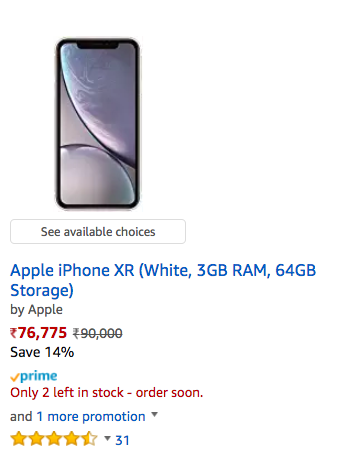 We can see from above images that OnePlus 6T has a much higher unit sales than iPhone XR. Both models were released around the same time. Despite much higher brand equity, iPhone XR will find difficulty in increasing traction in a market with devices like OnePlus 6T which is priced at half the cost and higher specs. Due to price reduction in older models, we should see a greater share of these iPhones in the total product mix. Even in the last cycle, the share of older models was increasing. We can see in the above image that for June 2018, iPhone X sales made less than 20% of the total sales. At the same time, older models of iPhone 7, 7 Plus, and 6S cornered more than 40% of the total sales. Due to higher prices in the latest models, if customers opt for older models, pressure on the margins. IHS Markit's teardown of iPhone 7 showed the bill of material, BOM, cost equal to $ 224.80. The retail price of iPhone 7 in the latest cycle is $ 449. Even after inflationary pressure, if we assume the BOM or iPhone 7 was in the same range, the margin on this device is only 50% in the current cycle. On the other hand, the BOM or iPhone XS Max is $ 390 which puts the BOM cost equal to only 35.8% of the retail price. Investors looking for an ideal entry point should wait for further correction and price stabilization. 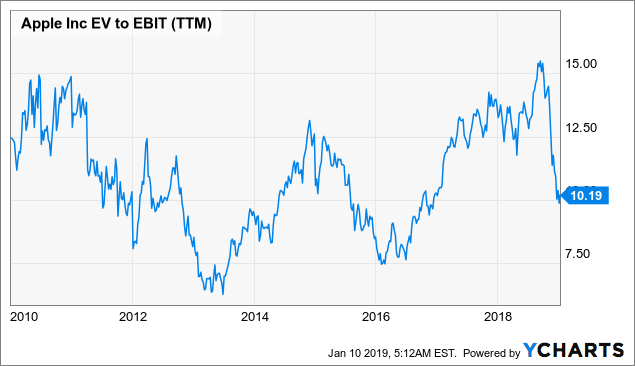 At lower valuation multiple, Apple will also benefit from a higher share count and a better yield. The next bullish run in Apple will not happen until the company can find another growth engine. A possible option is streaming and ad business. But it would take several quarters before either of these verticals shows meaningful results. Apple could have made a big mistake in the pricing of the recent flagship models. The demand for these devices in international markets is not as strong as earlier. Many of the international regions are also suffering from lower economic growth prospects and a higher currency devaluation. This has increased the price of Apple devices in these markets. At the same time, Chinese OEMs are becoming more aggressive in their branding and their pricing. We should see the current bearish sentiment in the stock continue for some time. Once the price has stabilized at a lower valuation multiple, value investors could look at this stock as a possible option for a long-term buy-and-hold. to hit the Like button at the bottom of the article.